Thread Bear's Picnic - www.aoibheni.com: Girl can't help herself. It looks so snuggly warm! And, as ever, I am in awe of your crochet skills. Lovely sock. I can't knit socks, I don't know why but whenever I do I start going crazy and end up ripping them out. 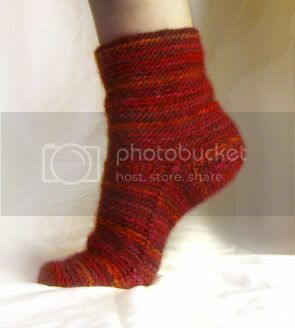 I knit other things like mittens in the round on small needles and they are fine but socks drive me mad. So a crochet sock seems like the perfect solution. I must learn tunisian crochet so! It looks lovely; I can't believe you got a whole sock out of some playing-around on Friday!